I’ll be celebrating Thanksgiving, so this is my last post of the week. I’ll be back with more on Monday. You may have noticed I haven’t put up a trip report in awhile. That’s because I just haven’t been traveling, and you know what? It’s been glorious. I broke that streak recently with a quick trip to Vegas on JetBlue. This was unremarkable in pretty much every way. But that won’t stop me from writing it up. I paid $207.18 roundtrip just over 2 weeks in advance. Why JetBlue? Well, I didn’t want to go to LAX, and JetBlue had the flights at the right times vs. Southwest. Added bonus: I was able to reserve windows in the back both ways. I checked in on the app and made sure I had Pre Check. Then, as usual, I left home an hour before departure. On a Saturday morning, the Pre Check line was empty, and I was at the gate with time to spare. It’s hard to beat this view in an airport. Boarding seemed to start pretty early. Since I was in the back, I was in group B (my first time using JetBlue’s boarding groups). I headed back and climbed up the stairs. I have to say, I do like that Tartan tail. There were two flight attendants in the back talking to each other, paying no attention to passengers. I quietly said good morning, but they didn’t flinch. It’s possible they just didn’t hear me. I headed up to my seat, and couldn’t help but think just how dated the cabin now looks. The old, bulky seats with the small screen just look so out of place, but hey, they’re comfy seats at least. The window was incredibly dirty, but that didn’t stop me from gazing out toward the tail of the Hawaiian aircraft about to leave for Honolulu. Since boarding began so early, we were able to push back really early too. The captain came on to say the weather was nice, but we’d have a few bumps enroute. Then we were on our way. It was a beautiful morning as we climbed out over the port before winding around toward the northeast. The captain was right, we had a few bumps once we got over the desert, and he did leave the seatbelt sign on the whole time. It was at this point that I realized that bluetooth headphones are a problem. I wasn’t able to listen to TV since I had left my corded ones behind. So I rotated between watching some meaningless college football game and just looking at the map. Most of time, I was just looking out the window anyway. The flight attendants came through with drinks, but it didn’t go quickly. We had already been level at 23,000 feet for awhile (it’s relative, we were only there for 10 minutes) by the time I got my bottle of water. I do love that JetBlue still hands out water. We were well into descent by the time they came by with snacks. I grabbed PopCorners for me and cookies for the kids when I headed home. I soon realized that we were going to do my favorite Vegas approach, a straight-in landing on the 1s. You get to come in low over the rolling, desert terrain. Then not far from landing, you break out into the sprawl of suburbia. Right before landing, the gleaming towers of the Strip come into view. By Monday, I was ready to come home. The problem is that the first flight to Long Beach isn’t until 10:53am, so we decided to wait it out instead of braving LAX. I left the hotel in a Lyft at about 9am, and we had quite the adventure. The Lyft driver took over half an hour and kept going the wrong direction. If you need to know one place in Vegas, it’s probably the airport. Even with that delay, we were at the airport with a little over an hour to spare, and the lines were empty. We hung out at the gate and waited for boarding. My friends got on first since they had bought extra legroom, but I was in group B again. The flight attendants were friendlier this time around. As I walked on, I noticed this was a newer interior with bigger screens. I say “newer,” but this still isn’t new. I’m looking forward to trying the newest retrofits one of these days, even with 12 more seats onboard. Everyone was seated quickly, and we were ready to push back early. I looked out my window and saw something strange. That Airbus still looks weird in those Alaska colors. Then, magic happened. We taxied out quickly to the 26s and leapfrogged a couple others (who I just assumed were waiting out weather delays to the East Coast), and jumped into the cool, still air. That was fast. Vegas is always bumpy on climb, but this was about the smoothest I can remember. At altitude, we still had that same light chop we had on the way out, so the the seatbelt sign never came off. We climbed all the way up to 28,000 feet this time, and we didn’t spend more than 5 minutes there. By the time I got my bottle of water, we were well into descent, cruising over Big Bear Lake (and its low water levels). Snacks did come through again, and I grabbed pretzels and cookies (for the other kid). We touched down early and found ourselves at the gate an incredible 21 minutes before schedule. After hopping off, I met up with my friends again and we headed out. I have to say that a boring set of flights is my favorite kind. Happy Thanksgiving to all of you in the US. I’ll be back with you Monday. That approach to Vegas sounds a bit like my favorite: MSY runway 20 from the northeast. You come in over the lake, with the city a few miles off to the left, then swing around and approach really low over the suburbs. Best approach: South side of the aircraft on approach to ORD on runways 27 and 28, at night. The glistening symmetry of Chicago laid out below is amazing as the plane comes off the lake and onto final. Second is pulling out of SFO in late afternoon on the left (north) side of the aircraft as the plane turns east and toward the rest of the country. On a clear day, the view toward the city and the Golden Gate almost rivals Chicago. My favorite MSY approach: runway 2, from the south, low in over the mighty Mississippi full of freighters, at sunset. It’s only happened once, and it took my breath away. Ironically Beantown Blue was in my station about two weeks ago and I was also admiring the look of the tail as I walked out to our gates…sharp looking aircraft! Uneventful trips are fine but sometimes it is just a little too routine. I want my flights to be events (safe, but events), even if I’ve been on X aircraft this year and 000’s of miles. Still it says a lot about our modern society that the flight is the uneventful part of a weekend adventure. As a kid the flight was surely the biggest part of the adventure. It really is amazing how once “eventful” experiences can become so routine for us. Whereas not long ago flying was a very big deal (even if relatively safe), today it is so routine as to be rarely worthy of note, unless one is going to an exotic locale. Similarly, for many people going out to eat at a restaurant, even at a lower end restaurant, was a big deal and a special occasion when they were kids. Now that they are busy working adults and have higher disposable income than their parents did, it’s a routine thing. My rule is that the more petty/picky the complaints are, the more routine an experience has become for the person complaining, and the more almost spoiled/habituated they have become to the experience. For example, people who complain that the wine served on their international flight in business class wasn’t amazing… Sure, that may be a valid complaint, but if that is what a person is complaining about after they just crossed half the globe safely in a day, and were able to get some decent sleep in a lie-flat seat in the process, life must be pretty damn good for them, and they are pretty fortunate. Gotta have the right perspective sometimes, lest we forget how fortunate we really are. Glad LGB don’t penalise you for arriving early the way that LAX do – as you know, Brett, I got stuck in the penalty box for 45 mins last week. Anyway, just completed 8 flights in 10 days, and several were anything but routine; a very last second go-around at SFO (with evasive manoeuvring before full throttle ascent), and a sideways landing at IAH (after which the Captain declared his surprise at the location of the runway after emerging from the clouds), being a couple of the more interesting moments. Boring? Really? What would you regard as a fun trip, then? According to your report, it looks to me that JetBlue did the job just fine. Circa 1994, I took a flight on America West from ONT-LAS. Was running late but the captain came on and said he’d try and make up some time. True to his word, he firewalled it. I wore a wrist watch back then (remember those?). I set my stopwatch. Wheels up to touchdown was a whopping twenty-seven minutes. No joke. Have a buddy who was with me and I still talk to who can vouch for it. THAT was an incredible flight. In order to make that kind of time, had to shoot up like a rocket to get and stay above FL10 and then he dropped it like a rock on approach. This was on a 737-200. And sitting in the back, it was an ear splitting flight almost the whole time. Loved it. But that was back in the Pleistocene Age….. Thanks for the write up and have a happy Thanksgiving to you and your family. If you want something that, umm, truly different and tacky, you would be hard pressed to top this. *Not mine/no affiliation. Just posted for information only. * “Pr0n for Women,” a book with pictures of hunky men doing household chores, offering to turn off the football game so that they can talk with their wife, etc. The narration of “Go The F*** To Sleep” by Samuel L. Jackson is awesome! Good news on the Bluetooth front: The IFE vendors finally solved that problem and are working on getting the kit on to planes starting early next year: https://paxex.aero/2018/10/bluetooth-audio-ife/. Still won’t be universal (or even common) for a decade or more, but at least they know it needs to happen and are working on it. While we wait for that to happen try this out. Lets you use bluetooth headphones with any headphone jack. I don’t fly without it now. 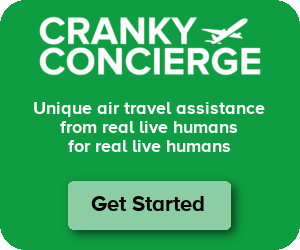 Cranky, Please don’t criticize Jetblue’s current cabin. That is the last land of humanity in the sky here. That couple extra inches of leg room really makes flying experience much much better. I am really not looking forward to their inevitable new layout no matter how many bells and whistles they have…. Pitch is great, but it’s all for nothing if the seat cushion is so worn that it feels like you’re sitting in a pre-mold rollercoaster seat. My Uber to the airport went the long way around, I think they realize tourists won’t be repeat customers and can squeeze a couple extra bucks out of them. Both Uber and Lyft have switched to fixed pricing when you give them a destination… the driver gets more money, but Uber/Lyft eat it out of their portion. Agree that uneventful flights are my favorite (especially if uneventful means on time). Seems like circuitous Lyft and Uber rides to/from LAS are a theme, at least on this thread. We had a 3 1/2-hour layover there on a Saturday week ago and the Lyft driver took what seemed like a long, crisscross route to the strip (went to Tacos El Gordo near the Wynn for lunch). It’s also a bit of a hike to the ride-sharing pickup area depending on where you exit the terminal. Lastly, bit off-topic, but do you know if Southwest has any plans to upgrade customer experience at it gates in Vegas? They always seem small and crowded, and while, um, historic and with an interesting view, I always dread when I have to make the long walk to the B gates and the crowded mess you find when you emerge from the hallway. Thanks for another enjoyable trip report and happy Thanksgiving to you and your family, Brett. Eric – Nothing I know about for Vegas. LGB is indeed a pleasant little airport, although it could use more frequent bus service. once a day (PDX) or twice a day (SFO) doesn’t seem sustainable.